Chowing down on some yummy Norwegian Pannekaken! Human nature craves warmer climates in the midst of winter, the tail end of which most of the world’s population is currently experiencing. I guess that’s why Norway’s nickname isn’t Land of the Noontime Moon (its winter personality). As March transforms from a lion to a lamb weather-wise and as the northern hemisphere welcomes longer days of sunlight (or any at all in the case of the northern reaches of Norway), please join us in “visiting” Norway – the Land of the Midnight Sun. 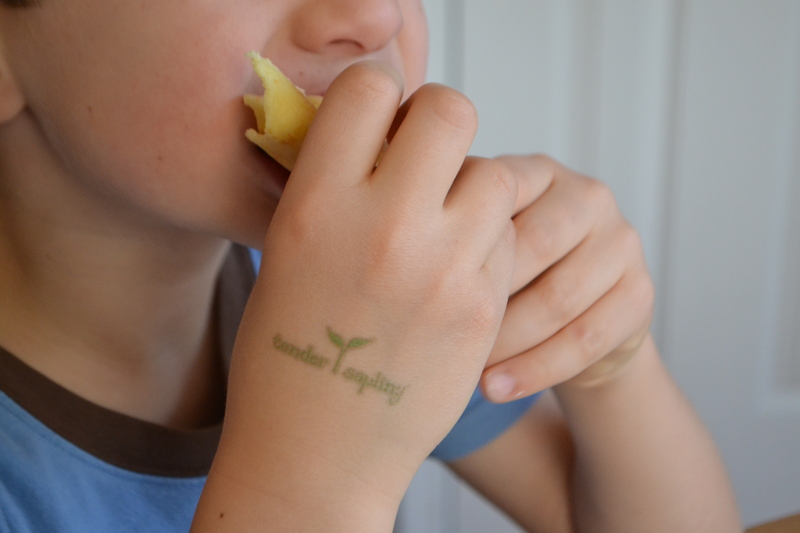 This is the first stop in our new Tender Sapling Travelers Series. Each month we aim to focus on a part of our wonderful planet and its peoples. This installment will explore the original peoples of Norway, a gripping true story of bravery and love, and lots of food, with links to ethereal music and a couple of meal blessings sprinkled in. When our family dove into Norway’s history, we learned that the indigenous people of Norway may have come from Central Asia. They eventually were pushed into the more northern lands as the Vikings gained a foothold in the south of what is modern day Norway. These original peoples are now the Sami of Samiland, which includes much of northern Norway and neighboring parts of Sweden, Finland, and Russia as well. During your childhood you may have learned of the Sami as Laplanders. This name is considered a belittling term by the Sami and is no longer used. The Sami people are well known for their reindeer herding and semi-nomadic lifestyle. We loved reading all about this through a delightful picture book, Far North by Jan Reynolds from the Vanishing Cultures series. This photo journal follows a family with two young children through their days migrating from their winter lands to their summer lands and celebrating the end of a long, dark winter with their community by holding the annual reindeer race and more. One image that sticks in our mind from this book is that of the girls, bundled up and asleep on a sled as their family moved home and herd. The “more info” page at the end of the book ties in these traditional peoples with a truly modern phenomena – post-Chernobyl radioactive poisoning. This provides a launching pad for a lesson in environmental toxins and the domino-like global effect that such disasters have on the earth and all the life it supports. In short, a type of lichen with an extremely limited de-toxing ability absorbed the radiation. This led to large numbers of reindeer that rely on that type of lichen becoming dangerously radioactive. The lives of the reindeer were endangered, thus affecting the livelihood of the Sami herders. Back to celebrating the Sami culture, our exploration led us to find some videos of lovely folk singing called joiking, as well as modern Sami music by Máddji. The English translation of her lyrics is as captivatingly ethereal as her music. During our exploration of Norway, we fell in love with the picture book The Race of the Birkebeiners by author Lise Lunge-Larsen and illustrator Mary Azarian. The book is based on a true story of how the greatest Norwegian king during the Middle Ages was saved as a baby by his mother, a priest, and two of the most talented skiers among the fierce warriors known as Birkebieners, named for the birch bark protection they wore strapped to their legs. The first account of this fairy tale-like story first appeared in 1264, just 58 years after Prince Håkon’s right to the throne was disputed by rivals who intended to capture and kill him. His mother enlisted the help of a priest who helped her escape with the babe and led them safely to the Birkebeiners. With the further help of their two most-skilled skiers, the group of five braved steep, snow-clad mountains during a fierce winter storm that nearly killed them. At one point, the Birkebeiners skied ahead with the baby strapped to one of them in order to find shelter and save the little one, feeding him ice until his mother could catch up and nurse him. Once safely on the other side of the mountains, the Prince’s rivals demanded proof that the baby was truly the heir to the throne, requiring that his mother endure a trial by burning rods to show that she was not lying. The queen valiantly passed the test in what became known as a miracle – three days following the burning of her hands by rods, her hands showed no signs of such trauma. The Prince was saved and would go on to usher in medieval Norway’s golden age as its longest ruling king. This story of heroism and love is beautifully told and its illustrations bring to life the original event that inspired Norway’s annual long-distance cross-country ski marathon, the Birkebeinerrennet or the Birkebeiner race (of which there is an American version too). The 54 km route is said to trace the original route of the team that saved Prince Håkon in 1206. To honor the origins of the race, all participants carry a backpack weighing about 8 pounds (at least 3.5 kg) – which is symbolic of the weight of the one-year-old babe. Of course, all parents reading this know that’s not the weight of the average one-year-old – more like a newborn! – but hey, more power to them carrying any extra weight on a grueling race. The idea of all these huge men hauling symbolic babes across some 33 miles of winter wonderland captured our imaginations. 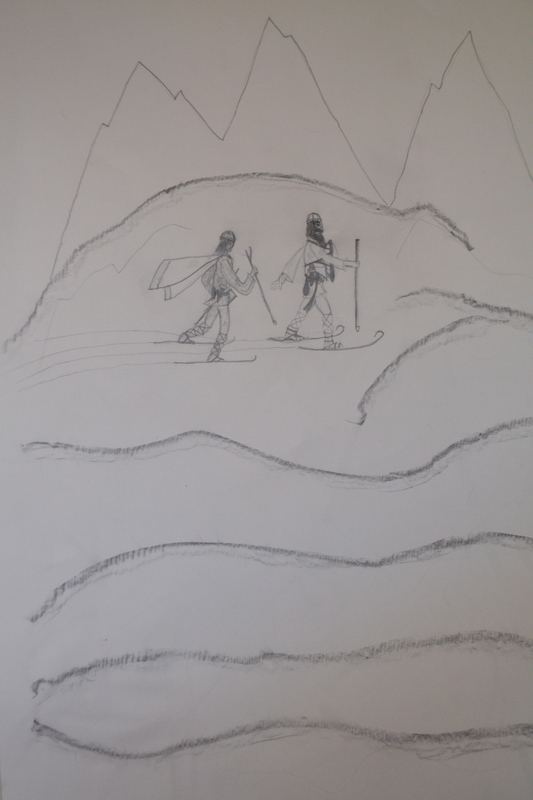 Our oldest son sketched this picture of the two Birkebeiners skiing through the storm. The larger man is depicted with the babe strapped to his chest and protected from the bitter winds by his shield. 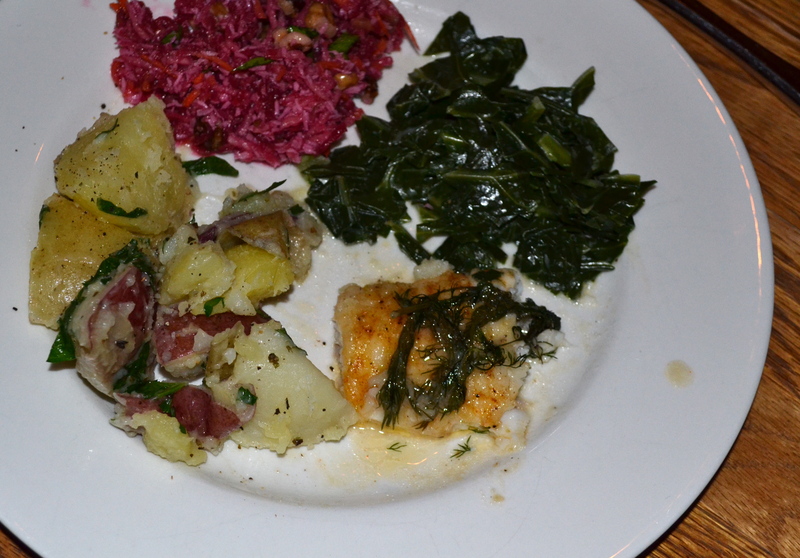 The kids loved the lemon-baked cod, which I adapted heavily from an online recipe. Basically, we poured melted butter and lemon juice over the filets; sprinkled it with some flour, salt, pepper, and paprika; and then added fresh dill and quartered lemons before baking. Everyone gobbled up that, the potatoes, and the creamed greens which we inspired by this recipe, and we adults enjoyed the beet salad immensely. The apple cake was something we picked up at Whole Foods that seemed to go with the meal. We’re betting most Norwegians would have welcomed it to their table too. Yummy! Fun to make! And the kids had fun assembling their food! 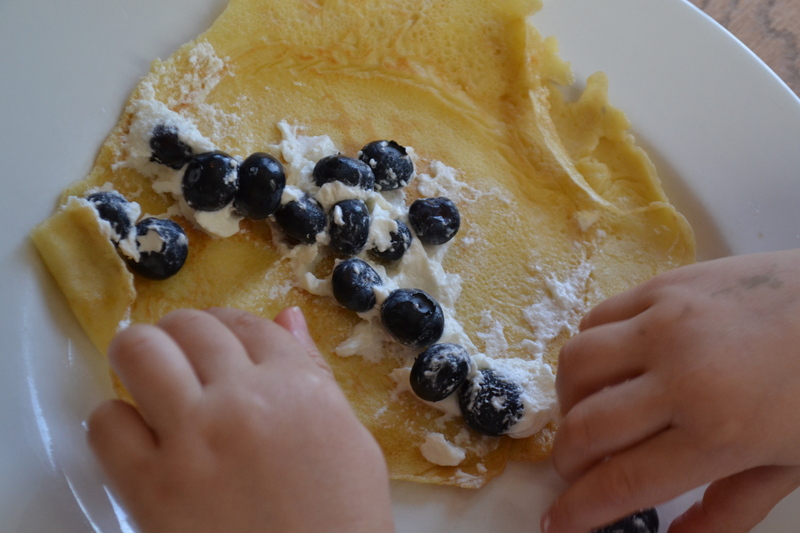 They smeared jam and/or fresh whipped cream onto pannekaken – Norwegian-style crepes, loaded them with fresh berries, and ate to their hearts delight. 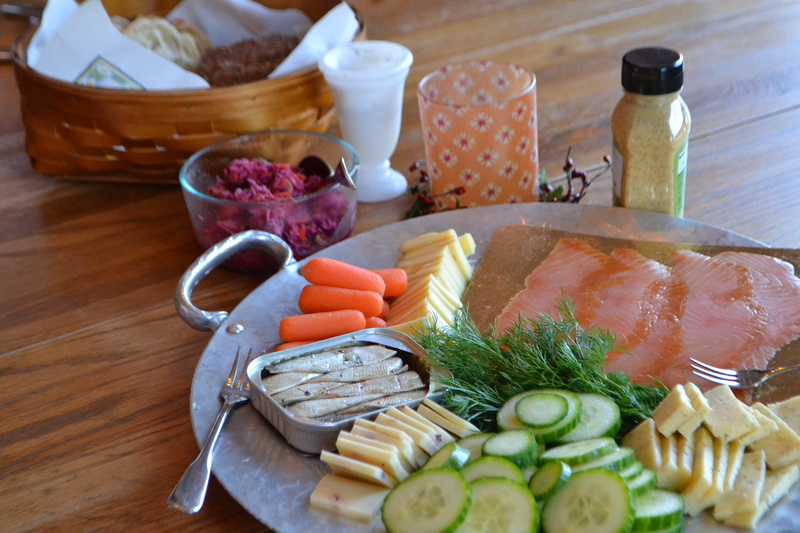 The “cold board,” Norwegian version of the Swedish smorgasbord, made for a perfect lunch. The kids each assembled their own snack-sized open-faced sandwiches and cracker stacks using any and all of the following: smoked Norwegian salmon, sardines, cucumber slices, carrots, fresh dill, Jarlsberg cheese, Havarti dill cheese (borrowed from the Danish who enjoy their own version of the koldtbord), Norwegian crackers and rye bread we baked ourselves. The leftover beet salad from the night before was the perfect complement to this delicious buffet. We made a pork roast mixing our pressure cooker recipe for pork roast w/ herbs from this recipe, and adding onion, garlic, potatoes, carrots, and rutabagas. We defrosted some frozen rotkol (red cabbage recipe similar to this one, which we made during our “visit” to Germany a couple months earlier) to honor the Viking influence on the Norwegians. 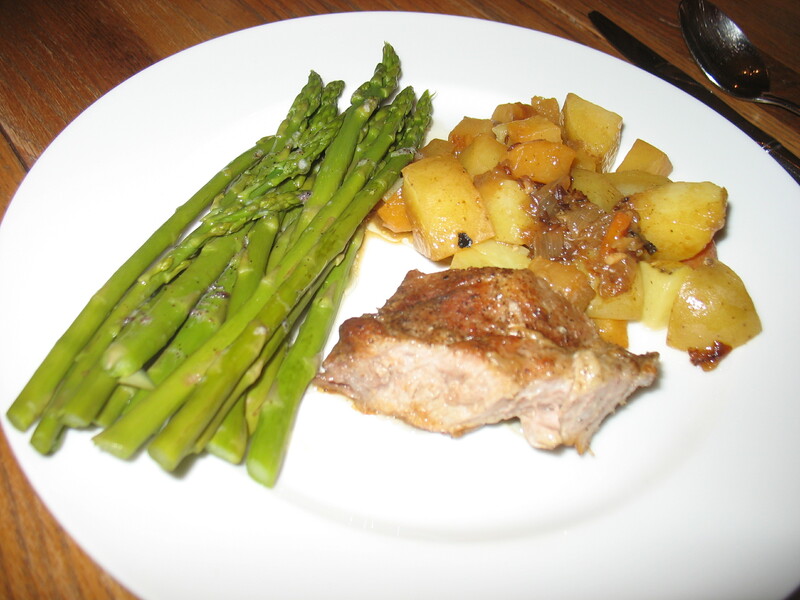 Finally, asparagus was dressed up in a new way using this simple and delicious recipe. To top off our Norwegian exploration, we searched for meal blessings to offer at our homeschool cooperative’s gathering to share highlights of each family’s discoveries. We enjoyed these at home too during our Norwegian feasting marathon. We give our greetings to thee. As we do enjoy it. Hail and love to Thee. ALL: Hail and love toThee.. Finally, the heavens smiled on us and we got a couple inches of snow, which strangely seemed enough to tide the kids over until a serious snow finally arrived last week. 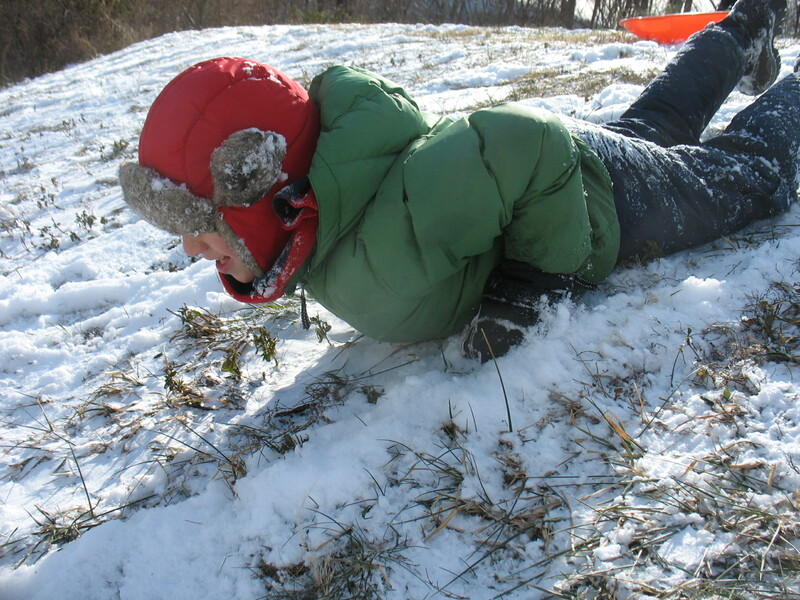 Here’s a fun snapshot of our middle child sledding sans sled on the bit of snow, invoking the courage of the Birkebeiners to brave what’s affectionately known as “big hill” in our ‘hood. Happy final days of winter to all and we hope you enjoy this window into learning about Norway now and anytime throughout the year! Please share any favorite books, foods, etc. you love about or from Norway in the comments below! Categories: Have Fun, World Citizenship | Tags: Birkebeiners, global studies, homeschooling, meal blessing, Norway, Norwegian food and recipes, Sami culture and music, Tender Sapling Travelers | Permalink. This has given me a ton of ideas. Thanks Emily! Have fun exploring Norway and please share anything you find along the way that others might like!